Call it fall, call it autumn, either way it means beautiful colours emerge across the forests of Canada. The best time for fall colour watching in Algonquin Park is usually from the third week of September through the second week of October. Weather conditions, summer rainfall (or lack of it), wind and many other factors influence the timing and duration of fall colour season. 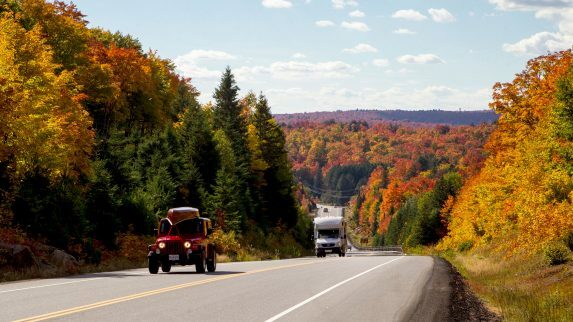 Due to the latitude and elevation of the park, Algonquin’s foliage change tends to start earlier than other nearby areas in Haliburton or Muskoka. The Friends of Algonquin Park do a really good job of updating their Fall Colour Report, so check that page starting in early September and plan accordingly. Don’t be the person who gets told, “oh, you should have been here last week!” Some of our favourite foliage viewing spots are highlighted on the map above. Plan on making a trip to Algonquin Park this fall to see the beauty of all the colourful leaves, and if you want a little more adventure, stay for a day or two and book one of our day trips. Algonquin Outfitters understands that not everyone is ready (or simply doesn’t have the time) to go on a multi-day interior canoe trip. If your time in Algonquin Park is limited, Algonquin Outfitters offers a variety of day trips, starting at either our Oxtongue Lake or Lake Opeongo bases. Both self-guided and guided options are available. Day trips offer an opportunity for exploring Algonquin Park while staying at a nearby cottage or resort, making a stop on a driving tour or just to take a short break from city life. Explore our Algonquin Park Day trips here.